I discovered this movie about ten years ago, on TV. The next day, a co-worker asked if I had watched it; I said yes, and we both agreed we had been moved by it. For my co-worker, this was not surprising; she was a Catholic. But for me, a Jewish semi-secular humanist, it was odd to admit I had felt something close to faith because of a late-40s studio picture. The message of "The Miracle of the Bells" is that regardless of one's faith, there is the possibility of hope. The goodness that exists in human beings is not brought out by rigid observance to rules, but by acts of kindness and understanding. I don't want to say how this comes about or whether there really is a miracle in the Biblical sense. That is for viewers to find out. But the film brings tears to my eyes. Alida Valli is amazing-watch her face, her eyes, especially in the sequences where she plays Joan of Arc-she seems lit from within by faith. I love the scene in the Chinese restaurant, a scene of friendship and love. I wish this movie, like its heroine, was more well-known. 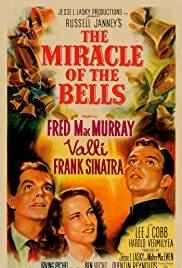 I try to help it along by mentioning it whenever I can as one of those little gems, a quiet picture that may make you think, a nice example of Hollywood fantasy films of the 1940s, and a movie that will help you feel better if you feel down.I know I just rented it for that reason.